Then it hits you, even though you’re identifying customer advocates like never before, you’re doing nothing to directly drive new sales with that information! Day in day out customers are putting their hand up and saying, in no uncertain terms, “I really, really, like your company”. So why aren’t you helping them to spread the word? Working with your customer advocates can drive enormous value for your business as identified in the book Creating Customer Evangelists. You don’t need to pay customer evangelists – most of the time you just need to get out of their way. It’s effective – I shouldn’t need to convince you that customer recommendations are an incredibly powerful sales tool. It’s fun – How much better can it get than working with people who love your product or service. 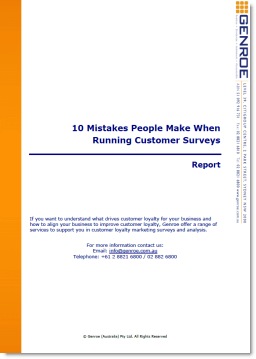 Use Customer Feedback to find them? That part is easy. If you already have a transactional Net Promoter Score process up and running using, say, CustomerGauge, then everyone who scores you a 9 or 10 is likely to be a customer advocate. If you haven’t implemented transactional Net Promoter Score perhaps you may have another customer feedback process or even a loyalty scheme that you can analyse for high rate purchasers who may also be advocates. Or you may even have a social media monitoring process that will let you know who is saying great things about you. Whichever approach you use, try to link it back to the person’s contact and purchasing history. With that information you will be able to drive the most action. How do you help them to help you? Just like the rest of your customers, not all advocates are the same. You have to be craft an offer that will appeal to them in order to be successful. Look to the segmentation approaches that have been successful for your business the past and see if they are applicable in this program. Perhaps you can create value sensitive programs for low value customers or custom programs for high value customers. In short, start with what has been proven to work for your business. Your first impulse may be to send your customer advocate a standard “refer a friend” or discount coupon offer. Don’t. While these work in other situations, for your customer advocate they are a slap in the face. Stop and think about it for a moment. This person has indicated that they are an advocate for you. If you send them a “refer a friend” coupon you become just another company wanting to use their good graces to grab some more sales. We really appreciate your recent customer feedback. In it you indicated you were a strong supporter of our company. Thank you. If you do recommend us to a friend or colleague please have them use this special telephone number/access code/restricted portal. This is our priority customer line and will ensure that they get the very best service when they contact us. Acknowledging the customer feedback in a sensible way. Do this and their already high perception of you will go up. They feel special: almost like a Platinum Frequent Flyer but without the overhead of all those gate lounges. They are reassured that their friend will get a great customer experience so their innate fear that their friend might have a bad experience and think poorly of them is abated. They will want to pass on this special privilege as quickly as possible. Of course you have to be able to deliver on that priority service experience, but that’s a given. The program described here is a classic triggered marketing program. As in all such programs; speed of the essence. In fact: speed beats perfection every time. If you already have a transactional Net Promoter Score process then you probably already have the data source and initial processes you need to get this up and running.